Wellbeing is a whole school culture which ensures that every member of the community can flourish. In developing the skills and character strengths that enhance wellbeing, our ultimate goal is to contribute positively to the wider community with meaning and purpose. 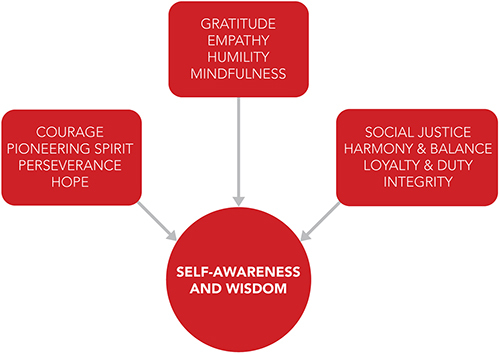 It is increasingly clear that in order to be fulfilled, successful and purposeful in life and work, we had to develop a wide range of holistic character strengths and skills to embed in schools. The Dulwich College International framework below provides the best mechanism to capture the diverse requirements of a Wellbeing agenda articulated through both the taught curriculum and co-curricular programmes across schools at any age or stage of development. Dulwich College International has adapted the IB's Approaches to Learning (ATL) framework for this purpose and the language can be revised as we move forward in our own particular contexts. Additionally, the character strengths and skills’ domains, clusters and descriptors can be regularly revisited to ensure they are meeting the needs of our community. By providing students and families with integrated and holistic support systems that focus on all areas of individual development, ability and interests, underpinned by the framework below, our students are provided with a supportive environment of mutual care and concern from all staff members.